The Pantone Color Institute is the entity in charge of selecting each year the color that will be the trend and that will mark the roadmap in terms of decoration, fashion, design and graphic arts. It is recognized worldwide as a source of information on color through trend forecasts for each season. 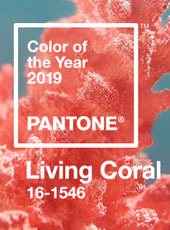 On this occasion, we say goodbye to the Ultra Violet 2018 and we welcome the color chosen for the year 2019 the living coral, Pantone 16-1546. Defined as a warm and cheerful tone, which invites the connection with nature.